Sabiñánigo, June 28, 2016. 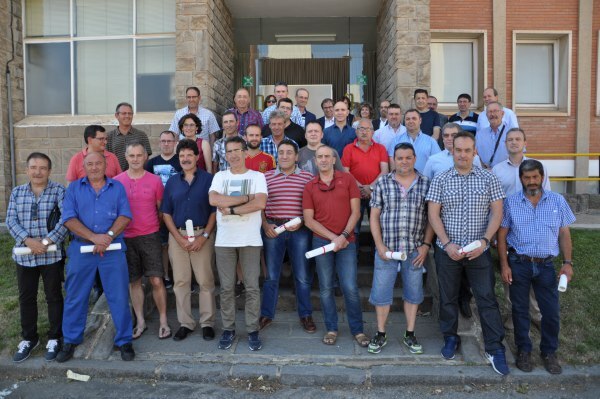 - A group of 76 employees of the Ercros factory in Sabiñánigo have received a professional certificate attesting their experience in the chemical sector; this collaborative effort between the Aragón Department of Education and the Aragón Federation of Chemical Industries and Plastics (FEQPA) has enabled to obtain an academic degree to those workers with extensive professional experience, but who lacked formal training. The ceremony of diplomas was held yesterday in Sabiñánigo’s factory and was attended by Mª Carmen Launa, Director of the Aragón Institute of Employment; Roberto Santolaria, Director of the Agency of Professional Qualifications of Aragón; José Antonio Estaún, President of the Federation of Chemical Industries of Aragón; Joaquín Sanmartín, Director of Ercros Human Resources, and Luis Gállego, Director of the Ercros’ factory in Sabiñánigo. The certification process began in January 2015. First a detailed report of each worker was developed, where their experience and training was credited. Then a commission assessed each of the candidates to determine if they could receive the accreditation. Plan and update employees’ information, training and awareness programs, in order to improve their preparation and motivation, it is one of the principles of Ercros social responsibility policy.